Where Is Saigon: Is It Ho Chi Minh City or Saigon? Which Is Correct: Saigon or Ho Chi Minh City? Where is Saigon? And are there any cultural or political implications of referring to Vietnam's largest city as "Saigon" instead of its new official name, Ho Chi Minh City? The short answer: No, you can safely still refer to Ho Chi Minh City as Saigon while traveling there. Saigon is situated on the southeastern edge of the Indochina peninsula along the South China Sea. Saigon is located 1,090 miles south of Hanoi, Vietnam's capital. The coordinates for Saigon are: 10°48′N 106°39′E. Saigon is UTC + 07:00 (12 hours ahead of EST; daylight savings time is not observed). The airport code is SGN. Is It Ho Chi Minh City or Saigon? Saigon, or Sài Gòn in Vietnamese, was merged with the surrounding province in 1976 and renamed Ho Chi Minh City to celebrate the reunification of north and south at the end of the Vietnam War. The city's namesake comes from Ho Chi Minh, the communist revolutionary leader who is credited with uniting the country. 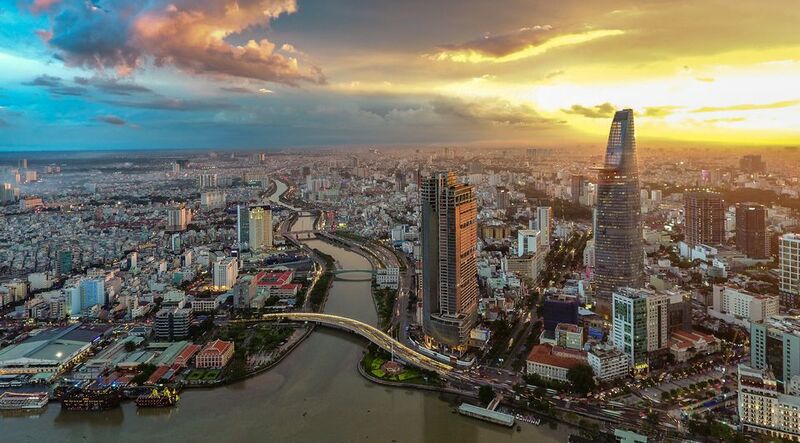 Although Ho Chi Minh City (often shortened to HCMC or HCM in writing) has been the official name of the city since 1976, the old name "Saigon" is still used daily by many Vietnamese — particularly in the south. "Saigon" simply has less syllables and is used more often in daily speech. On the other hand, official documents nearly always refer to Vietnam's most populous city as Ho Chi Minh City. The newest generation of Vietnamese youth growing up under the current government tends to use "Ho Chi Minh City" slightly more often. Their teachers and textbooks use the new name more often. Although interchangeable overall, both names for the city are commonly used for different areas. Southern Vietnamese people living in the suburbs of the city often refer to their area as part of Ho Chi Minh City. The area of Ho Chi Minh City encompasses over 4,100 square miles! This includes 19 urban districts and five rural districts. The surrounding provinces were not a part of Saigon before the merger and name change in 1976. When lumped together, the name "Ho Chi Minh City" is frequently used. Meanwhile, when referring more to the urban heart and areas such as Pham Ngu Lao around District 1, saying "Saigon" is more common. Again, age and background often influence which name is chosen. Younger people growing up in other parts of Vietnam may prefer to say "Ho Chi Minh City" while residents of the city still use "Saigon" in all but formal or governmental settings. The Vietnamese diaspora living abroad more often say Saigon. The airport code for Ho Chi Minh City is still SGN. Saigon is still used as a label for District 1, the center of Ho Chi Minh City. New hotel developments often opt for "Saigon" in their names for brevity rather than "Ho Chi Minh City." Some bus stations still label signs and tickets with "Saigon." The river flowing through the city is still named the Saigon River. Vietnamese people living overseas who fled at the end of the war often prefer to say "Saigon" for political reasons. In Hanoi and the north, you'll more often hear "Ho Chi Minh City" used. All government publications and productions use "Ho Chi Minh City." All official documents and writings should use "Ho Chi Minh City." Places in the rural districts surrounding Saigon, far from District 1, are often referred to as being "in Ho Chi Minh City" rather than "in Saigon." If you opt to say "Ho Chi Minh City," don't exclude "city" from the end as is sometimes done for other cities (e.g., saying "New York" instead of "New York City.") Only saying "Ho Chi Minh" may cause people to think you are referring to the historical figure. The cheapest flights to Vietnam most often arrive in Saigon; the airport is one of the largest in Southeast Asia. Despite not being centrally located, the city serves as Vietnam's travel heart. You'll have plenty of transportation options for getting from Saigon to Hanoi and all other points farther afield in Vietnam. Regardless of whether you prefer to say Saigon or Ho Chi Minh City, you'll have an interesting time in Vietnam's busiest urban center. Nightlife rages a little harder in Saigon than in Hanoi, and Western influences have taken hold. Saigon's first McDonald's restaurant opened in 2014, but the delicious pho still flows freely. Southern Vietnamese people claim to be a little more open than their cohorts in the north, meanwhile, people in the north think the southerners are out of their minds. Then again, lots of countries with a north-south cultural divide argue the same!